This didn't fit anywhere in our coverage this week. But I'll explode if I don't let it out of my system. Former House Speaker and future moon colonizer Newt Gingrich stumped Thursday in Spokane. But we were stumped (ha!) that he didn't mention his plan to establish a permanent base on the moon. Before the speech, I called up John Logsdon, professor emeritus at George Washington University's Space Policy Institute. 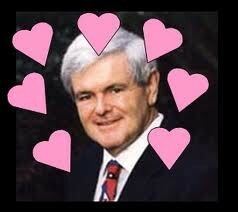 Gingrich's proposal "doesn't really pass the giggle test," Logsdon says. "What Gingrich did was take a reasonable idea and make it unreasonable," he says. "At its root, it's not crazy." Then why the celestial wet blanket, Mr. Professor? It took $155 billion in 2011 dollars to get us to the moon during the Apollo program in the 1960s, Logsdon says. And while a base of eight or nine people might be sustainable, it isn't feasible for Gingrich's dream of 13,000 moon pioneers. But Logsdon says doing permanent research could pay scientific dividends. Like extracting oxygen to use as rocket fuel for deep space voyages. Or harvesting helium isotopes that could fuel a fusion reactor. Which, he admits, hasn't yet been invented. Also, there may be water on the dark side of the moon that could be used to help support a lunar outpost, says Logsdon. But since we haven't done much actual scientific research, we won't know.